How Creative Can One Person Be? I recently met a woman online who has apparently been blessed with the creative gene from head to toe. 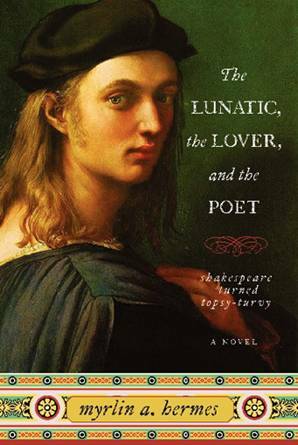 Myrlin Ambrosia Hermes (and she says Yes, that is her real name) has written a novel based on the premise that Hamlet was gay. Shakespeare Gone Topsy-Turvy as she calls it. The book was just released from Harper Perennial on Tuesday – I’ve ordered my copy but haven’t received it yet. (it was on sale at Amazon, BTW). 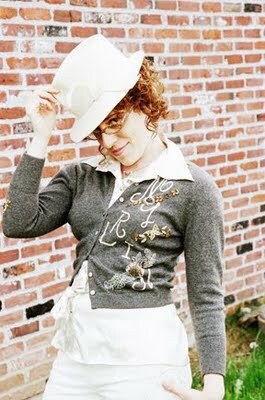 Anyway, I became aware of her through her Guest Blog Post on a well-known literary agent’s blog. Her post was one of the best, and most helpful, posts I’ve ever read. She explained clearly and very informatively about how to make your own video trailer for marketing, without spending much money and without really knowing what you’re doing. (Check out her trailer here). I’ve made a video trailer for Is Harvey Dunne?, and the process was pretty brutal. I wish I’d had her suggestions before I made mine (I don’t know how I didn’t find the free sites she did!). In addition, when I visited her website, I saw that she is apparently a very good seamstress as well. She went to a literary ball, and made her dress a walking advertisement. 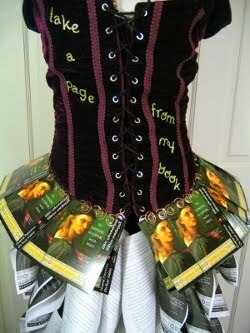 Her skirt was made of pages from her book, and the waistline was circled by copies of the cover. Her bodice displayed the words take a page from my book. Then people could just pluck a sample from her skirt. Now how creative is that? Very cool. In addition, she’d apparently been watching a reality show about making gowns out of paper, and decided to try an experiment – she would make a bridal gown solely from items she’d purchased from the dollar store. Impossible, you say?? Think again. I didn’t realize I was looking at dollar store material until I zoomed in for a closer inspection. (Note: I tried to locate the pic on her site, but I think she may have removed it. I’ll ask her about it, and if I get it, I’ll post a picture). Creativity just piled upon creativity. To top it off, I emailed Myrlin, and she sent me a long email in reply. Friendly and talented – you can’t beat that! Link to her book at Amazon. Link to her book at Barnes & Noble. Prev Is the Self-Published Author World Connivingly Indie-Cent? Thanks for the comment, and thanks for visiting. I’m looking forward to Myrlin’s book as well!